The Great Books: Liberty U’s Barnes & Noble is like any college bookstore anywhere, right down to the overpriced coffee. 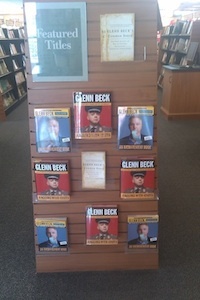 The books are a little bit different, though (Photo: Tim Murphy).Lynchburg, Virginia—Although a friend in Charlottesville had informed me that Lynchburg might be a nice place for me to check out my first gun shop, the real attraction in town is the campus of Liberty University. Founded by the late Rev. Jerry Falwell, the televangelist who once suggested that 9/11 may have been God’s punishment for homosexuality (I mean, really, who can say for sure? ), it’s emerged as one of the nation’s most prominent conservative Christian institutions. At the law school, the world’s only full-scale replica of the Supreme Court courtroom invites students to think about their futures in public life; last year, the school’s president, Jerry Falwell Jr., shut down a Democratic student organization because of the party’s position on abortion. A young woman is there with her parents, waiting for an official school tour to begin. She’s currently in college (in North Carolina, I think). “It’s a ‘Baptist’ college, in quotations, because I don’t think they talked a lot about God the week I was there,” says the mom, matter of factly, to tour guide. “Mom, they did!” the daughter protests. Parents are required by a federal law to say stuff like this at least once on every college tour, I think. 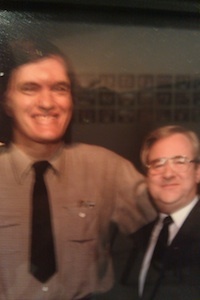 Jerry and Jaws: You may know Richard Kiel as Bond villain Jaws, or as Mr. Larson in Happy Gilmore. Jerry Falwell knew him as “the guy standing next to me” (Photo: Tim Murphy).The family leaves and I get to talking to a man named Ryan, a former student who now works at the school. I ask Ryan about Liberty’s commencement speaker last spring, Glenn Beck. It wasn’t quite Obama at Notre Dame, but, he says, “a lot of people were like ‘whooooa—he’s Mormon.” The elderly man sitting at the desk, who I presume works there but doesn’t really talk except for once or twice and even then for never more than five seconds, jumps in at this point: “He’s not a Christian,” he says, speaking of Beck. Then he goes back to his book. Ryan doesn’t really mind much what Beck is, though. He says that while “about a third” of those in attendence at the ceremony were skeptical going in, once Beck started things off by expressing his admiration for the school, he had the crowd in hand. As he explains it, “I don’t really care whether you’re Buddhist, Hindu, Jewish, or Christian. I just care about how conservative you are.” Needless to say, Glenn Beck passes that test. As MoJo‘s Adam Weinstein notes, Beck is getting into the education business himself, with the recent launch of Beck University. They’re two totally separate potatoes—Liberty, whether you like it or not, is an established institution that serves a specific community and does so very effectively—but there’s a common idea behind both of them: Unlike most any other higher learning facility I can think of, both institutions are bound extraordinarily tightly to the image of their founders. And in that sense, the approach to education mirrors their outlook on politics: rooted, above all else, in a reverence for those who came first. *According to Wikipedia, Jaws, aka Richard Dawson Kiel, is now an aspiring historian who recently published a biography of Henry Clay’s cousin—and Muhammad Ali’s (first) namesake—Cassius Marcellus Clay. Clay’s lockhold on the title of “Most Ridiculous Latin Name in American History” took a severe hit when Lucius Quintus Cincinnatus Lamar II arrived on the scene a few decades later. VIDEO: Glenn Beck Speaks at Liberty U.